Sam Borenstein died prematurely in 1969, largely unappreciated in Canada, but his legacy has grown formidably in the years since. We paid homage to him with a non-selling retrospective exhibition in 1978. Borenstein's daughter, Joyce Borenstein, produced an outstanding documentary, The Colours of My Father, 1992, which was nominated for a Hollywood Academy Award. Sam Borenstein has subsequently been celebrated with a solo retrospective exhibition at the Montreal Museum of Fine Arts, 2005–2006, an exhibition that traveled to three provinces and included stops in Toronto and Sackville, NB. His paintings also featured prominently in the Jewish Painters of Montreal exhibition at the McCord Museum/The Musée national des beaux-arts du Québec in 2008. Most recently, he was also honoured with a solo retrospective at the Yeshiva University Museum, 2011, in New York City. Recently, a street in one of Montreal's residential developments has been named after Borenstein. Place Sam-Borenstein is in the borough of Ville St. Laurent. It is the latest addition to the legacy of one of Canada's great artists. The market for Borenstein paintings has grown rapidly over the last ten years and those fortunate enough to have acquired them in the 1950s or 60s have seen handsome returns. Throughout my career as an art dealer I have been an admirer and enthusiastic supporter of the work of Sam Borenstein. It was a struggle against many odds. My efforts may have helped but it is his work that cannot be overlooked. I noticed it early on and once asked Mr. Watson, as I was then calling him, "don't you think Borenstein is a very good artist?" "No," he replied emphatically, "he is a great artist." He always had some of his paintings in his gallery and told me that two he had at home were among his favourites. At that time in the mid-fifties, the great van Wisselingh firm of Amsterdam held yearly exhibitions at Watson's, showing Van Goghs, Renoirs and generally great paintings. One of the partners, Mr. de Jong, once challenged me, "do you know who Canada's best painter is?" When I hesitated, he said, "Sam Borenstein, no doubt about it." We held two exhibitions during his lifetime. The second was rather successful, the first one just moderately so. Before the opening of the second exhibition I had a telephone call from Mr. MacAulay of Winnipeg who had the finest collection in Canada. He asked me to mark the three best Borenstein's sold for him, he was buying them. He had seen one of Borenstein's paintings in Winnipeg and admired it. On the first day of the show Peter Bronfman came in. One of the paintings I had marked sold for MacAulay was the one he would love to own, no other appealed to him as much. I decided to let him have it and marked another, equally good one for Mr. MacAulay. After several months of not having been paid by Peter, I started following up my statements with telephone calls, until one day a chauffeur brought back the Borenstein and left it in my hallway. I furiously telephoned Peter and told him that I found this unacceptable and that the painting would be returned to him promptly. Although he told me he would never do business with me again, and was as good as his word in the regard, he also told me that his wife had not liked the painting when he brought it home. Years later they divorced. Peter told me that Diane, who went to live in Israel, only wanted to take the Borenstein with her. She had gotten to like it! A client of ours came in during the show and, seeing a very large Borenstein sold for $1,000, he asked in astonishment if this could really be so. When I confirmed this, he exclaimed that he now was no longer the only one who had paid this high price. He had once been to Sam's house with the intention of buying a painting and knew that there were a great many in his basement. This man was Lou Ritchie and he found that Sam had taken only three to his living room and told him he could pick one. Lou demurred and asked to look at the ones in the basement but Sam told him they were not for sale. Lou insisted and after a short heated discussion Sam had opened the door and had asked him to get out. He had never before or since been thrown out of a house. Anyway, Lou was a nice person with a particular understanding for artists. He telephoned the next day and asked Sam the price of one of the paintings he had seen. Sam had not yet forgiven the provocation. The painting in question was normally selling for much less, but Sam had said, "for you it is $1,000," and Lou had paid it. Later he bought many more. I do not know why but one of the biggest detractors of Borenstein's art was Max Stern of the Dominion Gallery. He could have been a great help to the artist's career, but he always ran down Sam's work, calling him untutored and undisciplined and more in that vein. Maybe it was because his neighbour, Watson, featured Borenstein and admired his work. Perhaps he realized that he could not control the man nor the prices and for this reason he relentlessly knocked the work. Borenstein will be remembered as much as Max Stern. Reminiscences of an Art Dealer, Walter H. Klinkhoff (1993). A few words may serve to introduce this show even though the pictures speak for themselves quite eloquently. Sam Borenstein was a personality, a character, difficult and abrasive at times, uncompromisingly honest, and nowhere more so than in his art. Into this he poured his energy, without compromising to an insensitive public, making virtually no effort to sell his work. Never would he bring me any of his paintings. I would have to go to his house, where he would reluctantly allow me a limited choice of two or three out of a total number of five. It would be useless to plead to see more, "take two of these or none." If some recognition and success is being accorded to Sam Borenstein, as witnessed by this show, it happens posthumously, and has been slow in coming. Observant people, capable of judging for themselves or willing to accept advice, have of course bought his paintings in the past. I had two one-man shows in my gallery while Sam Borenstein was alive, and another after his death, selling most of the pictures. I first saw his work in Watson's Art Gallery and vividly remember a short conversation with Mr. William Watson in front of one of Sam Borenstein's paintings. I had remarked that it seemed to me that this was the work of a good painter. In a loud voice and with a stern face Mr. Watson replied, "no," and after quite a long pause, "a great painter." Mr. Peter Eilers, a partner in the renowned firm of art dealers, Van Wisselingh of Amsterdam, had the highest regard for Sam Borenstein as an artist. 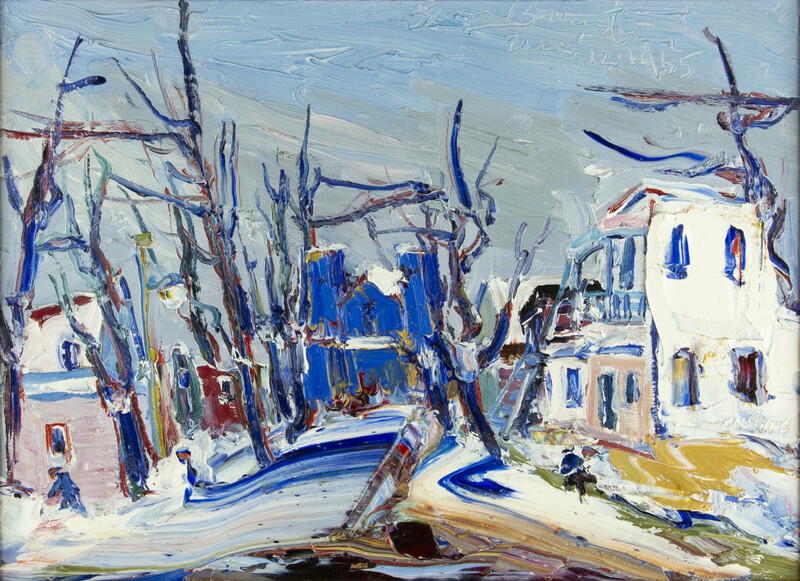 He often said that had Sam Borenstein lived in Paris, he would have won acclaim as a world renowned artist. A measure of the quality of Sam Borenstein's paintings is that they do not "fit in" or "blend" with furniture. In fact, they do violence to them, overpower them. Visualize a Borenstein canvas hanging next to a Vlaminck or fauve Derain, for instance, and it would comfortably hold its own. To compromise with the limited capacity for understanding by his public was totally unacceptable to this artist; and to the end of his days he painted in his personal style truly expressionistic pictures, lively in colour and texture, pictures one cannot overlook. Introduction to "Sam Borenstein" exhibition catalogue, Art Gallery of Hamilton, September, 1984. © Copyright Art Gallery of Hamilton and Galerie Walter Klinkhoff Inc.